Advanced EDM drill with Fuzzy logic control system. 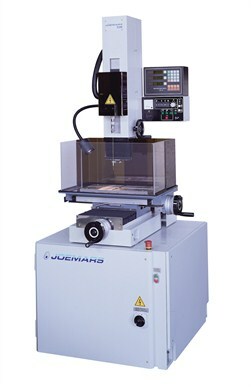 Can be set with only 3 operator inputs – Machining materials – Electrode diameter – Electrode wear rate. This allows the machine to be set and operated with ease, and increases efficiency. 100 sets of machining conditions. Special high pressure pump design allowing efficient sparking and high stock removal. Cutting conditions can be altered whilst sparking. The DZ range of EDM Hole Drills incorporate the fuzzy logic control system. These inputs will automatically determine the ideal cutting conditions, and set the 6 machining parameters accordingly. The z axis will automatically set to 0 when using edge find. An arc protection circuit will adjust the off time if the machining becomes unstable. If the unstable condition is not cleared the machine will stop to avoid damaging the current job.